Wu Ji explains how he met Xin Yue. At that moment Xin Yue digs her nail into his hand and he yelps “while I was in the forest —AHHHH” and the princess asks him what’s wrong. He glances at Xin Yue and says he was stung by a vicious, evil scorpion. Xin Yue quickly smiles and says that there are no such things in this room. Wu Ji quickly amends that it was in the desert… there’s a lot of poisonous insects in the desert and Xin Yue pinches him again. He says while looking at Xin Yue, if you glance at them they’ll stop. He goes on to tell the Princess that Xin Yue had put on this show to attract his attention, and only him. the Princess believes him and because of him, does not punish Xin Yue. She leaves and Wu Ji and Xin Yue sit in the now empty hall. She remarks that it is exhausting to talk to royalty, she’s informal and they bicker back and forth. She asks if he minds that a new person will come and try and take the Empresse’s place. The Empress is Wu Ji’s aunt, and Wu Ji says no, the Empress has a stable place and the Emperor trusts her. Also – everyone knows that the Empress in now too old, everyone’s looking to fill the void. She asks why he told the wolf desert story about her, he said that because so many people saw, he had no choice, the Princess was bound to know. Wu Ji lays down and says that she should feed him fruit in thanks. Xin Yue smirks and asks if this is how he treats all his maids? She throws a fruit at him. He retorts back that if he had maids like her, why would he come here? She asks if teases his maids like he does her, he smiles and says that if she comes to his place, she can she for herself. He asks if she’ll show her the beauty she talked about and she tells him maybe another day. Xin Yue goes to see Qin Xiang and they have the talk about who Qin Xiang is. Qin Xiang thanks Xin Yue from stopping her from appearing in front of the princess, it wasn’t the right time. Xin Yue asks what Qin Xiang wants, Qin Xiang is young but there is a coldness and calculating air around her. Qin Xiang tells Xin Yue about her past – Her birth father was killed by the Emperor, her mother took her and ran away, and then married the father of her two brothers. Her mother made sure that she would never forget to hate the emperor. That’s why Qin Xiang is here. Xin Yue asks isn’t it better to forget it all? If she doesn, then Xin Yue promises to help her. Qin Xiang agrees on one condition – that she gets to meet the emperor. Hong Gu and Xin Yue as just discussing how she bought the dance houses when two pigeons arrived. Xin Yue smile happliy as she realizes who sent them and would only pay attention to the pigeons. Hong Gu shakes her head and smiles at how happy Xin Yue is at see the two pigeons. Xin Yue goes to Jiu Ye’s house late at night, and ponders whether she should vault the wall or knock on the door. Just as she decides to vault the wall, the door opens. She exclaims at the housekeeper in surprise when the housekeeper tells her that Jiu Ye has told them to keep an eye out for her. She runs in gleefully when she’s about the run into Jiu Ye’s wheel chair, she spins around and faces Jiu Ye who smiles at her. It turns out that he did give her the pigeons, they are smart creatures who will only do her bidding because she’ll be the first face they see when she feeds them (the person who sold Jiu Ye the pigeons had the caged covered at all times so that the pigeons didn’t imprint on anyone else). She tells him that she’s named the pigeons Xiao Tao and Xiao Qian. Jiu Ye smiles and asks if he should call her Xiao Yue (a diminuitive) and she smiles back and says that she’ll call him Xiao Jiu. He looks into her smiling face with a sense of quiet admiration and longing. The next day, Xin Yue sees Eldest Brother Qin and Ding Ling – one playing the qin and the other the flute. She sees herself and Jiu Ye in their place, looking at each other. She and Qin Xiang walk over to them and Xin Yue teases Ding Ling and Eldester Brother. Qin Xiang drags her away, saying that she’s not to tease them too much. Qin Xiang goes to fix her red qin (musical instrument) at a local shop when she hears the sounds of a beautiful qin being played. She’s contemplative to its beautiful sound and when the owner asks if she wants to be introduced to the player she says no. She leaves while the player emerges from another room. The player sees the red qin and complements it and the shop owner tells him of the masked girl who had just left. Li San smiles and says taht if they are fated, then he and the girl will meet. Meanwhile Qin Xiang paints on a painting in a gallery. She gives back the painting to the owner who thanks her for making the painting even better. She leaves while Li San walks over to see someone had drawn on his painting. He sees that the painting he felt wasn’t completed now is vastly improved, and the owner tells her about the masked girl. Both Li San and Qin Xiang stand on a tower to watch the sunset. Two people in between them talk about growing old together and watching the sunset. Jiu Ye meanwhile is painting a picture of Xin Yue, and tells the pigeons to go back to Xin Yue. Xiao Tao (the white pigeon) lands in a well of ink by Xin Yue’s side and splashes ink all over her clothes. She gets mad and grabs the pigeon intending to make it as dirty as she is. Wei Wu Ji laughs as he sees Xin Yue putting ink all over Xiao Tao. He offers her a handkerchief to her, and when she’s about to grab it, he says that with all the ink on her, she’ll make it worse, he’ll do it. In reality, Wei Wu Ji is only making the ink marks on her face worse, and she sees it on the mirror. Enraged, she chases him around the house. They see Qin Xiang and Xin Yue orders her to stop. She looks at Wei Wu Ji, whose eyes stars hard into Qin Xiang’s covered face. She asks if he needs a handkerchief to wipe his drool. He sarcastically smiles and says no need, he’s still withstanding it. He tells QinXiang to unmask, while Qin Xiang is startled at his rudeness, but Xin Yue tells her that this is Wei Wu Ji and she uncovers her face. He tells Qin Xiang to leave. Xin Yue is curious as to why he told her to leave, he only agrees to answer if Xin Yue take a walk with him. That night Xin Yue and Jiu Ye are using pigeons to send messengers to each other (or as we modern day people call it, texting). He tells her of Xiao Tao’s inky body splashing his white clothes and then having to clean Xiao Tao as well. She smiles and replies back that XIao Tao’s been too wild it’s time she punished him. Jiu Ye reads the message and tells Xiao Tao “If I knew she was already mad, I wouldn’t have told on you!” Then reads that she cut down the dosage from her medicine, he replies back seriously and tells hers an exact prescription. 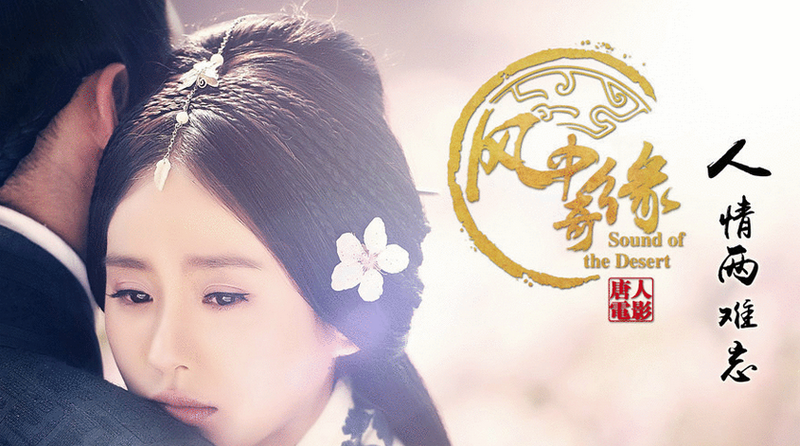 Xin Yue smiles to herself as she watches the Gold-Silver flower in her cup. Ding ling comes in and XIn Yue explains that the Gold-Silver flower is also known as Lovers’ Flower – the changing of colors representing lovers and how they would never be apart. This was all explained to her from Jiu Ye. Ding Ling sighs and says how nice would it be like to be like Lovers’ flower, to never be apart from the fated one. Xin Yue thinks of Xin Qiang and says that sometimes it’s the person’s own choice to not go after the one that loves them. Xin Yue goes to see the Princess and explains that she wants to present a girl to the pricness, this girl is quite beautiful. The Pricness smiles and says that Xin Yue controls four dance houses now and has legions of girls under her. If she says that she knows a beauty, then the princess believes her. The princess asks where the girl is and Xin Yue says that she will present the girl int 10 days. Why ten days the princess asks. Xin Yue explains that she needs to finish some preparations. She told the princess early because she wanted to be prepared for all possibilities. The princess smiles and tells her that she knows that Xin Yue won’t disappoint her. The two pigeons are staying with Jiu Ye, who tells them that they have to go back to their owner, to keep her happy for them. They have to go back so that Xin Yue doesn’t worry. He tries to call Xiao Qian over, but the pigeon is hold a slip of note in his beak. Jiu Ye smiles and says that everything he should say, he already has said. The things that he can’t say and want to say – he won’t. He smiles and says that some things said will hurt the person, so why say it? XIn Yue is eagerly waiting the arrival of her next note and is disappointed to see nothing on the pigeons’ legs. Just them Hong Gu and Qin Xiang asks that she meet with them. Xin Yue tells Qin Xiang that they need to use the 10 days time to teach her things so that she is prepared to enter the palace. So far it’s following the flow of the novel well. I still can’t take my eyes off of Hu Ge. I think Hu Ge’s acting in this one is amazing, so much so that he is Jiu Ye. There’s moments that I feel bad for Jiu Ye, because he’s so afraid of loosing and doesn’t even think that Xin Yue might love him. As for Eddie – everything is good – the stare he gave to Xin Qiang game me goosebumps and not in a good way. He’s pretty good but again. Withholding judgement. I also think Hu Ge is so immersed in his role (doing a great job), but I do love Eddie and Shi Shi’s bickering, every time Eddie appears on screen I have a smile on my face. I adore him so I think I might be a little bias on my opinion of him. Haha that’s my problem too! I’m edging towards Hu Ge like moth to flame – knowing that he takes on characters that end up with the shittiest ending and still rooting for him. Eddie is good and I just need more time with “Wei Wu Ji” haha. For me it’s more that I fell in love the Hu Quo Bing while reading the novel so I stayed faithful to the character regardless it was Hu Ge or Eddie Peng who got the role. I must say so far the way Eddie is portraying the role is how I envisioned HQB/WWJ while reading the novel. So I have no complains in that area. Haha I know – I love HQB in the novel too, he was perfect and I see the flashes of arrogance in Eddie Peng’s performance. Out of curiosity, are you thinking of watching YZG? I’m so conflicted – I loved the book and it ripped my heart into tiny pieces but Yu Zheng is making it and it’s clear that Tong Hua 恨他直到恨之入骨。囧。I thought about recapping it but I’m also waiting for her next novel – which is about YZ after she leaves Han (reportedly). So I’m leaning against it for now. I never been a fan of Yu Zheng’s work, but I will most likely watch YZG since I read the novel. Plus I love Chen Xiao ever since Female Prime Minister, I also think Yang Rong is an amazing actress. As for Angela Baby err… I’ll have to watch it before I pass judgement. Chen Xiao and his eyebrows – he’s talented for sure and those eyebrows should get their own accolades. I look forward to your views of the drama when it comes out. 🙂 And let me know if you ever read Tong Hua’s next novel! You’ll probably end up reading it before I do, is the novel end out yet? I looked for it today but didn’t see anything yet, just the description, when I have time I might look for it more carefully. I’ll let you know. Reading Tong Hua’s novels is like willingly having your heart stepped on. I don’t know if I can withstand another book about Yun Ge. Hahaha, you have a will of iron and a strong constitution! I actually looked through your library to see which CNovel to pick up next (having trouble deciding). I got really depressed after BBJX and CXS messed with my emotions. I think we’ll have lots to discuss once her new books hits. You prefer modern or ancient? I thought A Mistaken Marriage Match: A Generation of Military Counsellor《错嫁良缘之一代军师》is pretty good. My tastes run ancient. I just looked it up and it looks great. I’ll get into it once I finish tonights recaps (and probably addicted to it by tomorrow). Thanks! I’m in team Eddie, he is so cute. I watched fanmade mv for Eddie and Shi Shi, they both so cute together. I can’t stop laughing at some scenes. But where can I read full recap?